If you love eating well while doing good, get thee to Share Our Strength’s Annual Blogger Bake Sale, this coming Saturday at Midtown Global Market. You might not know it, but Minnesota has an incredibly talented, vibrant food blogger scene. We call ourselves Fortify: A Food Community, where we connect virtually and in person with the food industry and food lovers in any industry. We love to cook, and bake, and share recipes, and gather to help out where we can. This year’s event is coordinated once again by Delightfully Midwestern blogger Lisa Nguyen Gaulke. When we chatted about the upcoming event, I mentioned it would be fun to share a recipe from last year’s sale with all of you. 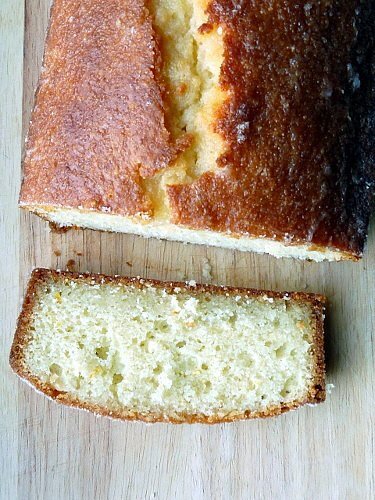 She said, “You have to ask Angharad for her lemon cake recipe, it was my favorite item and last year’s best seller…partially because I bought six slices myself!” And so I did ask, therefore the gorgeous recipe below for Lemon-Drenched Lemon Cake, perhaps the best cake name ever. Angharad’s blog is Eating for England and is chock full of perfect recipes, gorgeous photos, and bits and bobs of her travels home to England. And when your treats are devoured: Make. This. Cake. 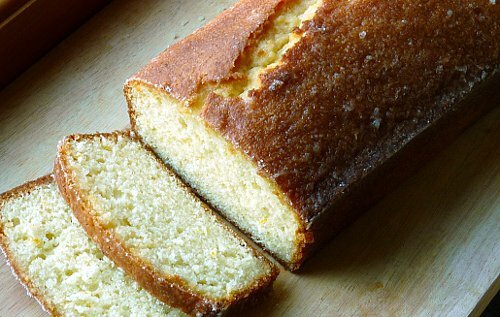 This recipe makes two cakes, to be baked in loaf pans. Preheat the oven to 350F and place a rack in the center. Butter two 9◊5-inch loaf pans, dust the insides with flour and tap out the excess. Place the sugar and the lemon zest in a large bowl and working with your fingers; rub them together until the sugar is moist and smells wonderfully lemony. Add the eggs and whisk them into the sugar, beating until they’re incorporated. Whisk in the vanilla extract, then the cream. Continuing with the whisk, or switching to a large rubber spatula, gently stir in the dry ingredients in 3 or 4 additions; the batter will be smooth and thick. Finish by folding in the melted butter in 2 or 3 additions. Pour the batter into the pans, smoothing with a rubber spatula. Bake for 55 to 60 minutes, or until a skewer inserted into the center of the cakes comes out clean. After about 30 minutes in the oven, check the cakes for color and if they are browning too quickly, cover them lightly with foil tents. While the cakes bake, make the syrup: Stir the water and sugar together in a medium saucepan over medium heat until the sugar melts, then bring to a boil. Remove the pan from heat and stir in the lemon juice. Pour the syrup into a heatproof bowl and let cool. When the cakes are done, transfer them to a wire rack to cool for 5 minutes before turning them right side up on the rack. Place the rack over a baking sheet lined with wax paper and, using a thin skewer, poke holes all over the cakes. Brush the cakes all over with the syrup, working slowly so that it really seeps into the cakes. Leave the cakes on the rack to cool to room temperature.